Touring caravans do not need an annual MOT like a car but it’s important to have your caravan serviced every year to make sure it’s safe whilst on your travels and also to maintain any manufacturers’ warranties. Recently we made a video that looked at what is involved in a caravan service. From a caravan insurance viewpoint caravanners must make sure that their tourer is maintained in a sound and roadworthy condition and that all precautions are taken to prevent and minimise a claim. In this month’s community poll, we’d like to know if you think caravans should have an annual MOT and why? Simply choose from the options below and leave a comment in the box below. Do you think caravans should have to have an annual MOT? We’ll report back the results in May. I would NOT Happy with an annual MOT, perhaps every three years would be ok. If dealers offer a better service and had to carry out habitation checks that would le be better. I store my Van at a CAssoa LOCATION where some vans are in an awful state. I note one can has not moved for 4 years. Surely if you have your van serviced annually to the NCC standard it’s as good if not better than an MOT. On the road a van still has to be road legal, how many vanners know their weights, loading, gross train weights for. C licence legality etc. As a road going vehicle weighing in at 1 to 2 tonnes it needs to be treated like any other road-going vehicle. I learned the hard way about tyres that had good tread depth but were past their best before date. Dealers could carry out an MOT as part of an annual service but would they need to be registered as MOT test centres? As an MOT inspector I think that an MOT for caravans would be a great idea to boost the profits of caravan dealers with very little help to road safety. The biggest cause of caravan accidents are due to inexperience of drivers and the need to replace tyres after the recommended time as they can crack on side walls and deteriorate well before they wear out. Check lights, hitch, tyre condition, tyre pressures and brakes before you go. Same responsibilities as your tow vehicle. all trailers and caravans should be tested, i work in the motor trade and we see some very poor condition towed vehicles. My caravan is serviced by an approved engineer every year. A certificate and a sticker are provided. It is in ones own interest to ensure contemporary, hi-tec vans are regularly serviced to avoid costly repairs. When insurance claims are dealt with the regularity and frequency of competent servicing should be taken into account. I do not think an mot but I do think a service of some kind even if it is a dig job. I think it should be a check list type so that it can cover road worthiness and insurance cover. But not like a car mot. a dim view of any caravan that causes an accident. No MOT, regular servicing is sufficient. I am interested in knowing how many claims were made and dismissed due to poor condition of the caravans mechanical elements regardless of the cause of the accident.or incident. What do the insurance company’s think, do they want an MOT. We’ve hardly ever had any claims where a caravan has been found to be in a poor condition. But we understand if a mechanical element of the caravan fails during towing the consequences can be catastrophic so we can see both sides of the argument. The worry would be is that it would deter some careful caravan owners from continuing to tour due to additional costs and time of having the tests carried out each year. You can’t put a price on safety and not all of us are capable of doing our own servicing..
MOTs are a good idea! I whole heartedly agree with Geof, It would be a cash cow most caravan owners check their vans before the winter and after. I payed over two hundreds pounds to have my van serviced which included checking brakes a bit of grease on moving parts. BUT it is mainly for the warranty of the van, Look what has crept in on cars now, completely different to years ago. It seems that there are many who would see compulsary MOTs for caravans as a nice lucrative little earner for them and it would the poor carvanner who has to pay. read; ripped off. Also, vehicles registered as Historic (over 40 years old)do not need a MOT and road tax is free…… Although it does have to be applied for. Would this 40 year rule apply to caravans as well?? It would be interesting to find out. Perhaps not a full MOT. Although an annual service could be compulsory to ensure safety, tyres, battery, electric and gas. Again, thin end of the wedge. How long before we have to pay RFL? I think that safety is important but an mot would be a money maker, road side checks should be more common. Service costs are now quite expensive now, and having a annual service sticker on the aframe is a good visual check at any time to see if the caravan has been maintained. The amount of caravans now on the road and looking at the conditions of some of them are in will tell you if it’s been looked after …motorhome and campervan have to have a m.o.t on the 3rd year from new so why not .. do you know if your brakes are worn do change the tyres after 5 years old. If caravans were all serviced annually, as they should be, there is no need for a separate mot.any problems should be picked up and put right at the service. Don’t think( m o t ) is ness/ but I do think should be serviced , each year, this could be proof that caravan is being looked after we always have our service recipt with us when touring saying that our last van .2017 service did 30 miles after service and both wheels sized up ? this happened (lucky) at a caravan dealers unlucky as I was part exchanging it ???? Don’t trust some dealers on servicing and, another money making exercise I think. Its like cars. You can get a cheap MOT offer but they always screw you for something. My last one was a few flakes of orange lacquer on the indicator bulbs. They said they were showing white light, impossible to tell as the lenses are frosted. New ones made no difference only ripped off to bump the price of the MOT back up to normal price. I know for a fact that some caravan dealers don’t check the brakes on servicing. after servicing, I had to do a job and found that the red paint line on the hub nut hadn’t been touched even though they charged me for one shot nuts. They tried to tell me they re painted the line back on. Sorry to hear of your bad caravan servicing experience. We’re sure most dealers perform a very genuine and thorough caravan service, particularly if they’re a member of the Approved Workshop Scheme. This issue is one that could be very effectively argued either way! Firstly, many owners take great care of their (expensive) caravans and ensure that everything is serviced and well maintained. I would say that covers the majority. So why impose yet more bureaucracy on them for no good reason? Then there are the “well if it works why spend money checking or maintaining it” and it’s those type of users that would be most effected (in a positive manner) by any compulsory test. Then there is the question of what exactly would be tested? Logically there would be just four items, tyres, brakes, lights and finally (possibly) structural Integrety. After all of that how would the lack of testing actually be enforced? The caravan doesn’t have its own registration mark (unlike many EU countries) so it’s MOT status cannot be checked by roadside ANPR cameras (like car MOT and insurance is) So it would rely solely on a police officer physically requesting sight of its MOT certificate, at the time the caravan is actually present on a road (which in any 12 month period will, in all likelihood be very minimal anyway) and when was the last time you even HEARD of, let alone experienced, a car being stopped by a police officer? An interesting idea, but when you look into the practicalities it’s not so simple as it first appears. Me? I think the juries out on the need for caravans to be MOT’d! After 3 (or 5?) years, like a car. For road worthiness (tyres, brakes etc) and safety issues such as gas and electrics. That way, you know its safe to tow and use. Cars also have a service on top for preventative care, which is not maditory but recommend, same should be for caravans. Caravan MOT’s could be a cash cow for caravan dealers with service departments. Road safety is obviously very important so if any MOT was introduced it should be for caravan running order issues. 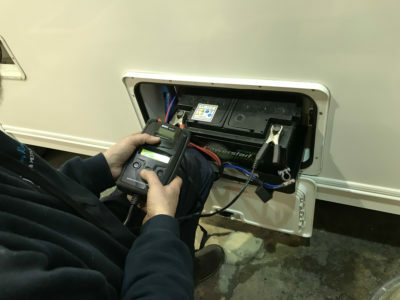 Many caravanners are more than competent and do their own service and maintainance, who is to say a service engineer would do the job better and make the caravan safer. If an MOT was introduced I have a suspicion that it would develop over years to cover all sorts of minor issues. A couple of years ago this was under consideration by the Eu, a lot us us wrote to out MEP’s expressing our displeasure. I would sooner see public money being spent on more worthwhile and easier administered schemes. To put things into perspective what record is there of incidents involving caravans giving blame to inadequate caravan maintenance. I would have thought the majority of incidents occur because of excessive speed for the road conditions.